The food in the restaurant was very good. Very much enjoyed the entertainment while having our dinner. Where to find Beaverton hotels near an airport? Where can I find hotels in Beaverton that are near tourist attractions? 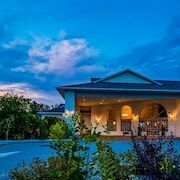 There are no Expedia-listed hotels in Beaverton itself, so a good option is to stay in one of the 12 hotels less than 0.1 kilometres (0.06 miles) away. The Best Western Plus Couchiching Inn, Ontario, which is the closest accommodation, sits 25 kilometres (17 miles) from downtown Beaverton. 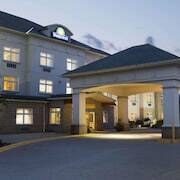 As an alternative, investigate the Days Inn - Orillia, located in Ontario, which is 30 kilometres (18 miles) away. The The Champlain Waterfront Hotel, an Ascend Hotel Collection can be found 30 kilometres (18 miles) from the middle of Beaverton. 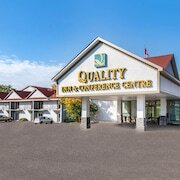 Or, alternatively, the Knights Inn Orillia is situated 30 kilometres (17 miles) away. 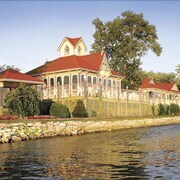 Two more places to rest your head include the Bayview inn and the Lakeside Inn. If you have time left, you might like to travel to other places in the Southern Ontario region. 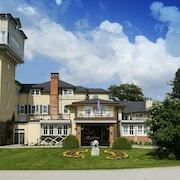 Check out Southern Ontario's traditional villages, churches and art museums. Those with a hankering for wide open spaces and fresh air should also take the time to to enjoy the region's beaches, coastal plains and forests. Visitors and locals alike in this section of Canada commonly enjoy skiing. 90 kilometres (55 miles) away from Beaverton is Toronto, where you can explore CN Tower and University of Toronto. Expedia-listed Toronto hotel options include the The Ritz-Carlton, Toronto and Four Seasons Hotel Toronto. 90 kilometres (55 miles) to the south of Beaverton, is Downtown Toronto, which is home to the The Hazelton Hotel Toronto and Windsor Arms Hotel. The Church of the Holy Trinity and Mackenzie House are a couple of the popular attractions to check out in Downtown Toronto. If sport is a favourite pastime, make the time to visit Air Canada Centre, which is 90 kilometres (56 miles) to the south of Beaverton. Those wishing to find accommodation near to the action can choose from the Shangri-la hotel Toronto or the Trump International Hotel & Tower Toronto. Pearson International Airport can be found 90 kilometres (57 miles) away from Beaverton. Travelers who choose to stay close by, can easily book a night at the Sheraton Gateway Hotel In Toronto International Airport or Residence Inn by Marriott Toronto Airport. What are the most popular Beaverton hotels? Are there hotels in other cities near Beaverton? 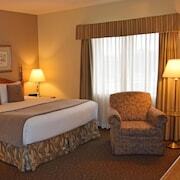 What other types of accommodations are available in Beaverton? Explore Beaverton with Expedia.ca’s Travel Guides to find the best flights, cars, holiday packages and more!